Thailand’s NokScoot is aiming to launch scheduled services in May-2015 with an initial fleet of three 415-seat 777-200s. The long-haul low-cost joint venture between Thai Airways affiliate Nok Air and Singapore Airlines (SIA) subsidiary Scoot is planning to serve China, Korea, Japan and potentially Singapore in its initial phase. NokScoot is eager to enter the fast-expanding but increasingly competitive Thailand-North Asia market. But the start-up is unlikely to pursue significant growth until it is able transition to new-generation aircraft. The 777s are an interim solution that is unlikely to be profitable but enables NokScoot to quickly establish a presence on several key routes. NokScoot was initially planning to launch scheduled services in late 2014 starting with flights to Tokyo Narita. But it has encountered repeated delays, mainly on the Japanese end. NokScoot is now simultaneously seeking approvals from several authorities, giving it the flexibility to launch with one of several potential routes. Nok Air and Scoot initially agreed in Dec-2013 to establish a joint venture long-haul low-cost carrier for the Thai market. The initial business plan envisioned an initial fleet of two 777-200s serving Japan and other North Asian markets. NokScoot secured an air operator’s certificate at the end of Oct-2014, ending a longer than expected certification process with Thailand’s Department of Civil Aviation (DCA). It immediately submitted an application for a foreign air carrier permit from the Japan Civil Aviation Bureau (JCAB) with the hope of launching scheduled services to Tokyo Narita in early 2015. NokScoot also has since lodged applications with Chinese and South Korean authorities. A new Thai DCA rule prohibiting the import of aircraft older than 14 years also provided an unexpected regulatory hurdle as NokScoot was unable to take over any of the five 777-200s Scoot had reconfigured in 2012 and 2013. NokScoot instead had to lease and retrofit slightly younger 777-200s from SIA. NokScoot took delivery of its first reconfigured 777-200 in late Nov-2014 and now has two 777-200s. Both aircraft have been leased from SIA for five years and retrofitted into two-class configuration with 391 economy and 24 recliner style business class seats. But so far NokScoot’s operation has been limited to occasional charters to Japan. In the nearly three months since it took delivery of its first aircraft NokScoot has operated only eight or nine charter flights. As NokScoot still has not been cleared to launch scheduled services to Japan it has lined up charter commitments for about 60 additional flights over the next couple of months. All the charter flights already completed and planned are to Tokyo and other Japanese destinations. NokScoot has had to push back its target launch date several times, initially from 4Q2014 to 1Q2015 and subsequently from 1Q2015 to 2Q2015, due to regulatory delays. As a result NokScoot will now miss all of Thailand’s peak travel season. The delay has been costly because NokScoot has hardly been using its two 777-200s and is slated to take its third 777-200 in early Apr-2015. The original plan was to launch scheduled operations with two aircraft and have the third aircraft to be used for network expansion in Apr-2015. Now the carrier will have a three-aircraft fleet before even launching scheduled operations. The SIA Group, which owns a 49% stake in NokScoot, stated as part of its 6-Feb-2015 earnings announcement for 3QFY2015 that NokScoot is planning to launch scheduled flights in May-2015 subject to regulatory approvals. NokScoot has not yet committed to or set a launch date or route. But as the submissions have been completed NokScoot is optimistic it will be able secure at least one foreign air carrier permit in Mar-2015, enabling it to begin tickets sales with sufficient lead time to launch services in May-2015. While the business plan has always envisioned starting with services to Japan, NokScoot is now taking a flexible approach and will be prepared to launch with services to Japan, South Korea or China or any combination of the three. This is sensible as regulatory approvals from aviation authorities throughout Asia-Pacific have become more complicated and tedious in recent months. For example, the launch of scheduled services at Indonesia AirAsia X has been held back the last two months by a much longer than anticipated process of securing approvals from Australian authorities. NokScoot has faced regulatory delays in several areas. But the process of securing approvals from Japanese authorities has particularly taken longer than anticipated. However, NokScoot is not the only start-up to have faced a longer than expected processing time from JCAB. 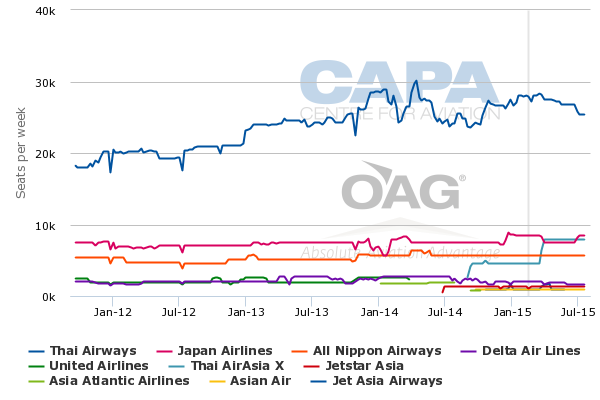 Thailand’s other new long-haul LCC, Thai AirAsia X (TAAX), secured its AOC from Thailand’s DCA in early Feb-2014 but was not able to secure final approvals from Japanese authorities until late Jun-2014. Like NokScoot, TAAX initially served Japan with charters as it waited for permission from Japanese authorities to operate scheduled flights. TAAX began operating charters to Japan in Apr-2014. TAAX began scheduled flights from Bangkok Don Mueang to Osaka Kansai and Tokyo Narita on 1-Sep-2014, seven months after receiving its AOC. NokScoot will likely compete against TAAX on both these routes. The Bangkok-Tokyo market is also served by Thai Airways, Japan Airlines, All Nippon Airways, Delta Airlines and Thai leisure carriers Asian Air and Jet Asia Airways, according to OAG data. The Bangkok-Osaka market is only currently served by TAAX, Thai Airways and Japan Airlines. TAAX also recently unveiled plans to launch its third Japanese destination, Sapporo, with one daily flight starting 1-May-2015. TAAX currently serves Bangkok-Tokyo Narita with one daily flight and Bangkok-Osaka with five weekly flights. But TAAX plans to upgrade Bangkok-Osaka to daily and add a second daily flight to Tokyo Narita at the end of Mar-2015. The additional capacity to Japan, which will give TAAX 10,556 weekly one-way seats to Japan in May-2015 and about a 20% share of total capacity in the Japan-Thailand market, will be made possible as it expands its A330-300 fleet. TAAX currently operates two 377-seat A330-300s and plans to take three more aircraft by the end of 2015. TAAX was able to secure approvals more quickly from South Korea, enabling it to launch a daily scheduled flight from Bangkok to Seoul in Jun-2015. Given the experience at TAAX, NokScoot could also end up securing approvals from South Korean authorities before it gets the green light from Japan. NokScoot would also be prepared to launch with flights to China if hears back from CAAC first. But most likely approvals from China will take longer than South Korea or Japan. 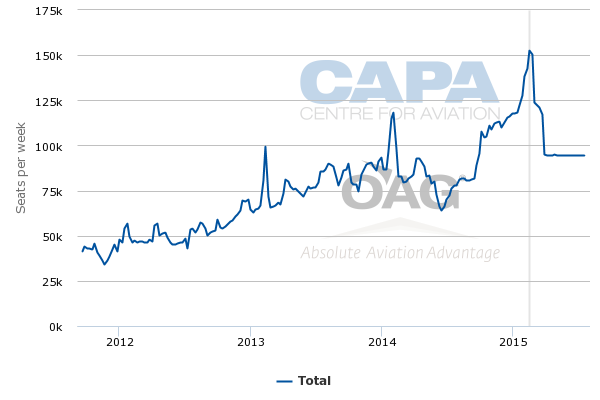 As CAPA previously highlighted, the Civil Aviation Administration of China (CAAC) has become stricter in recent months with approving foreign start-ups, including two new carriers in Cambodia. TAAX is also now seeking CAAC approval. While TAAX is currently focusing on building up capacity to Korea and Japan it aims to add services to mainland China in 2H2015 or 2016. While Bangkok-Seoul may end up being the launch route for both TAAX and NokScoot, China and Japan are the bigger markets. China is a bigger market overall but Japan is at least for now a bigger potential market for Thailand’s emerging long-haul LCC sector. For Thailand, Japan is a smaller and more mature source market than China. But Thailand is a bigger and faster growing source market for Japan’s tourism sector. Another important factor is that most of China is within narrowbody range of Bangkok while virtually all of Japan can only be served economically with widebody aircraft. And as none of the Japanese LCCs currently operates widebody aircraft this leaves the bottom end of the market for NokScoot and TAAX. Thailand-China is a bigger market overall and has experienced phenomenal growth in visitor numbers. Visitor numbers from China has increased nine-fold since 2009. China is now a larger source market than South Korea and Japan combined. But the Thailand-China market sees a much wider mix of competitors at the bottom end, including short-haul LCCs from both Thailand and China. Thailand-China has become a highly competitive market with scheduled seat capacity up by about 50% over the last two years. Further capacity growth is likely in 2015 as the rapid growth in inbound visitor numbers from China is expected to resume. 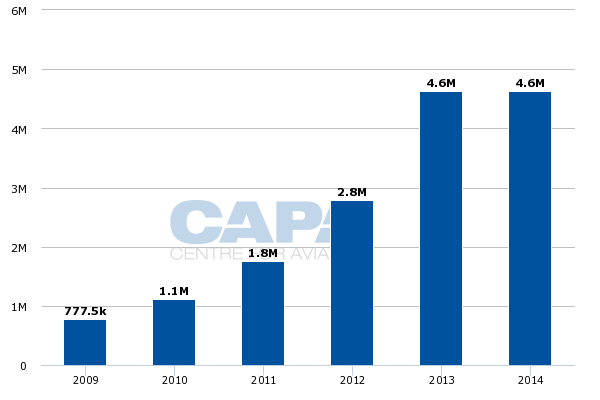 But Thailand’s long-haul LCCs will be sharing the growth with a large group of airlines. Thai AirAsia for example already serves several destinations in China. TAAX will only have the opportunity to serve destinations in northern and eastern China four hours or more from Bangkok. Nok Air and NokScoot do not have the same four-hour rule as the AirAsia and AirAsia X groups, which (as an internal policy) limits all AirAsia X franchises to routes of at least four hours. As a result NokScoot could end up serving some destinations in southern China. Nok already operates charters to China and is considering launching scheduled services to destinations in southern China in 2015 while NokScoot is looking at potential destinations throughout China. The Thailand-South Korea market has a similar wide mix of competitors. NokScoot would become the eighth airline and fifth LCC in the Bangkok-Seoul market. Asiana, Korean Air and Thai Airways currently operate from Bangkok Suvarnabhumi to Seoul along with four Korean LCCs – Eastar Jet, Jeju Air, Jin Air and T’way. TAAX is the only carrier with scheduled services from Bangkok Don Mueang to Seoul although this route is also served by Thai charter operators. LCC capacity in the Bangkok-Seoul market has more than doubled over the last three years and will increase further as NokScoot enters. Eastar Jet and Jeju currently operate two daily flights on the Bangkok-Seoul route while T’way and Jin Air each operate one daily flight. Jeju Air also operates one daily flight from Bangkok to Busan, a smaller route that is only also served by Thai Airways. TAAX and NoKScoot have a potential competitive advantage as they operate widebody aircraft, resulting in lower unit costs particularly as Bangkok-Seoul is a very long route (five to six hours) for a narrowodby LCC. While NokScoot will compete fiercely against TAAX the Korean LCCs could be most impacted as competition intensifies. Among the Korean LCCs only Jin Air will have the option of up-gauging Bangkok to widebodies as it is the only Korean LCC with a widebody fleet. Jin Air currently uses its newly added 777-200 to serve Seoul-Guam, a shorter route than Bangkok (four to five hours) that is also served by Jeju Air. With 415-seats NokScoot will have the second densest configuration after Cebu Pacific. Cebu Pacific is the only long-haul LCC with an all-economy product. NokScoot’s business class cabin features 24 recliner style seats. Scoot has a larger business class cabin on its 777-200s with 32 seats while all the AirAsia X carriers including TAAX have 12 lie-flat business class seats. NokScoot is using the same seats that Scoot used in retrofitting its initial fleet of five 777-200s in 2012 and 2013. But NokScoot has opted for one less business class row and has decided against equipping its 777-200s with wi-fi. Scoot installed wi-fi on its initial five 777-200s. Even short-haul sister carrier Nok offers wi-fi on its new fleet of 737-800. But the decision to equip these aircraft with wi-fi was more easily justified as Nok is committed to leasing its 737-800s for 12 years. NokScoot has committed to leasing its initial three 777-200s from SIA for five years but is aiming to phase out the type sooner. Its preference is to not acquire additional 777s beyond the initial three aircraft and instead acquire a new-generation type as its fourth aircraft. NokScoot believes it can secure 2017 delivery slots for new generation aircraft – most likely 787-9s although it also plans to look at A330s. NokScoot has not yet begun discussions with suppliers but expects to start discussing new aircraft types once it finally launches scheduled operations. After completing the first phase of its network build up NokScoot also plans to relook at potentially acquiring additional 777s as an interim solution. While its preference is not to invest in more 777s, strategically it may need to add capacity in late 2015 or 2016 and 777s are possibly the only option until 2017. NokScoot will likely need to source 787s on its own. Scoot received its first 787 at the end of Jan-2015 and has another 19 on order but has said all these aircraft are intended for its Singapore operation. Thai Airways also operates four 787s and has commitments for another four 787s. But Thai expects to retain these aircraft as it restructures and reduces the size of its fleet. Launching with 787s would have been a much better option for NokScoot. Scoot could have potentially subleased its first three 787s to NokScoot. But such a decision would have been controversial as Scoot has been looking forward to transitioning to 787s since 2012. As is the case with NokScoot, the Scoot 777s were always seen as interim aircraft. But delaying the transition to 787s at Scoot by four to six months and allocating the first three aircraft to NokScoot would have avoided a lot of expense at NokScoot. Arguably the cost benefit of starting from scratch with 787s at NokScoot would be more than the costs associated with keeping the 777s at Scoot in service for a few more moths (as the investment in retrofitting these aircraft has already been incurred). NokScoot would have had to wait a few more months to receive its AOC if it began with 787s. But as the airline is now launching in the off-peak season anyway such a delay would have been manageable. NokScoot is also taking a rather unusual approach in offering a product that has less frills than its short-haul sister carrier; the equation is usually the other way around. Nok Air follows more of a hybrid model and offers free checked baggage as well as snacks and water. NokScoot will follow the purer LCC model of Singapore's Scoot and charge for checked bags, seat assignments, food and drink. NokScoot believes the international market is different and passengers will not be confused. Nok is primarily a domestic carrier and over 90% of its passengers are Thais. NokScoot expects a more even passenger profile mix and believes the international market is more accustomed to the no-frills approach. NokScoot will offer a connection product with Nok as well as with Scoot, which serves Bangkok Don Mueang from Singapore. For now NokScoot is not planning to pursue other partnerships – although this could be re-examined once it completes the initial phase. NokScoot expects only about 10% of its passengers to connect at Bangkok Don Mueang to other flights. Scoot expects to eventually see a much higher portion of transit passengers but Bangkok is a larger local market than Singapore. 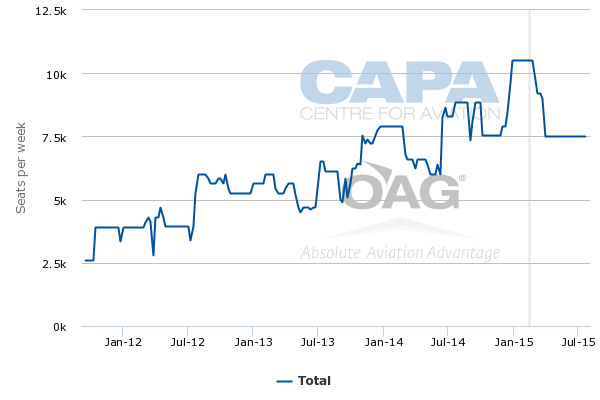 As CAPA previously highlighted, NokScoot has been considering joining Scoot on the Bangkok-Singapore route. NokScoot could potentially supplement Scoot, with the two carriers operating a combined two daily flights on the Bangkok-Singapore route. NokScoot has applied for a foreign carrier permit from the Singapore authorities. But NokScoot is not yet convinced it should serve Bangkok-Singapore as it believes this market already has a lot of LCC capacity. Operating Bangkok-Singapore would help boost aircraft utilisation rates – as it does with Scoot – but the average yields and load factor may not be sufficient to cover the cost of the flight. Even if it does not serve Singapore itself, NokScoot will be able to cooperate with Scoot. As soon as its website is formally launched NokScoot will sell Singapore and connections beyond Singapore. Scoot will also offer Singapore passengers NokScoot-operated flights beyond Bangkok to North Asia. NokScoot has had a tough pre-launch phase. The regulatory delays have been costly and the airline is eager to get off the ground. NokScoot could also struggle in its first year or two of operations as it does not have the ideal aircraft type or product. But the initial phase is more about establishing a foothold than making a profit. It is an important strategic play for both shareholders. The NokScoot market entry offers an interesting microcosm of the current status of southeast Asia's LCC market. For example, the very fact that such airlines are able to take such a long term view is a feature of their parentage, with their much larger and better established full service parents and affiliates able to absorb the costs of lengthy startups. It highlights too the growing interconnectedness of these various cross border entities as the transfer model takes a more important role in ensuring the viability of long-haul LCCs; and, as "second cousins", like Tigerair and Nok Air, evolve their operations the web of links will undoubtedly grow. These are complex relationships to manage, as each can have different ownerships and strategic objectives. At the same time though, the growing density of the webs does offer new options for scale and market tactics. And finally, on a less positive note, whether or not administrations like Japan's authorities are using admininstrative procedures as stalling - or protectionist - measures, there is always a risk that such behaviour can quickly spread. It is highly contagious and unproductive behaviour which easily produces retaliatory actions. In this case it has caused NokScoot considerable losses, with little likely real technical or operational cause, given the parentage of the airline. The process of liberalisation is a sensitive one, always challenging vested interests. But, especially in the Asian market where the growth potential is so vast, the real losers in these circumstances are consumers, the travel and tourism industry and, inevitably economic activity. In Japan's case there is an urgent need to reconcile its aviation administration's practices with the tourism goals of its political leadership.